The Ibex W2 Sport T is part of the Peak series. It's an 87% merino wool & 13% nylon blend. 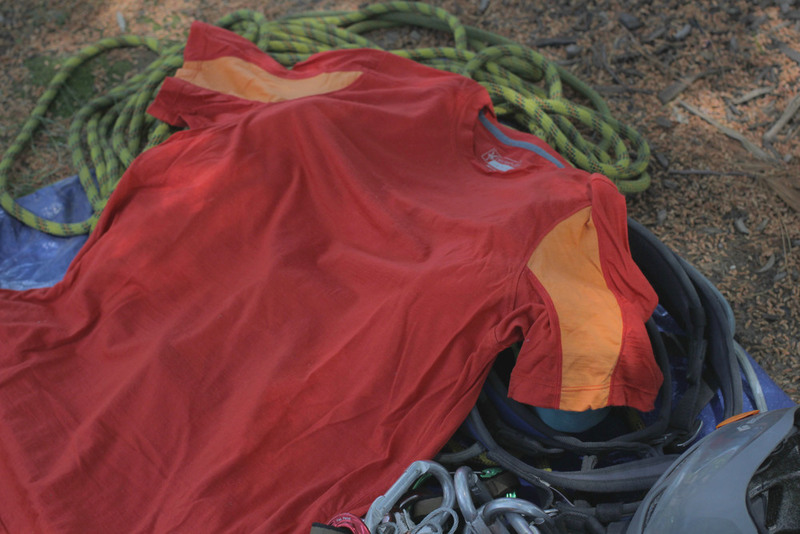 Quick drying and light weight make this shirt ideal for every outdoor adventures you can dream up. I have a "go-bag"... well actually it's usually just my messenger bag that I never unpack after a trip... but sure we'll call it a go-bag. (More on what's inside my go-bag in an upcoming blog series... stay tuned!) In this bag I keep everything I would need if I had to take a trip with just a few hours notice. Does this ever happen... not usually. Typically I have a week or at least a few days notice before I'm traveling for an assignment or project. Still... it's cool to think I can pick up and leave in a moment if I need to go. It's very Jason Bourne or James Bond "esk" except I don't carry a gun in my go-bag. I tell you all this to state that in said bag are clothes and amongst those clothes is the Ibex W2 Sport T and will be at the top of my travel clothing selection list for quite some time. Last year the company introduced the Rim series of garments which consisted of an 89% merino wool and 11% nylon blend. This year Ibex upped the ante even more introducing a new type of fabric to their Peak line of clothing. The Weightless Wool (or W2) is an 18.5 micron wool blend consisting of an 87/13 blend of merino wool and nylon. Pop quiz: Ibex has built a solid foundation, deeply rooted in one material... which is? Wool. Awesome... you passed... I knew you would. So is this company, which is very committed to sheep, going soft on that wool garment base and heading in the direction of so many other outdoor clothing manufacturers? I highly doubt it. However what I conclude they're doing (and frankly I like it) is finding ways to make wool a more versatile, all season material to fit whatever adventure you're engaged in. Ok, so what makes the W2 Sport T awesome enough to go everywhere I go? 1) It's super light and airy. Immediately when handling this shirt, compared to some of my other Ibex T's, I noticed that it was thinner and weighed less. 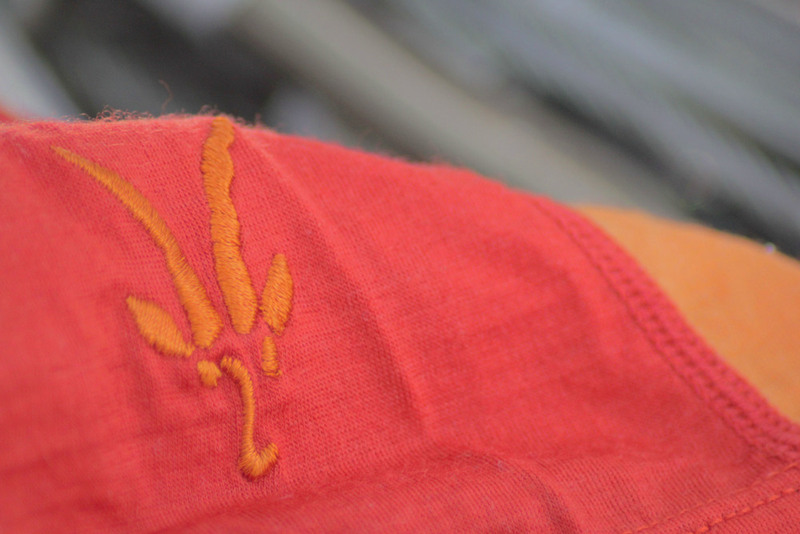 In fact, the W2 Sport T is the lightest of all of Ibex's t-shirts, weighing 5.73 ounces. I know it's like splitting hairs when you consider that other shirts like the OD Heather T and the Bouldering T weigh 5.76 oz and 5.81 oz respectively. However, when you're on a photo shoot, working on a commercial set or even better, climbing an awesome line or pushing up a steep grade on the trail and really burning the calories... you notice light and airy! Which leads to the next awesome thing about the W2 Sport T.
2) It's dries fast... I mean this shirt dries freakishly fast. I've worn this T hiking, rock climbing in addition to on assignments where I'm hauling gear and running like crazy. When it's hot... I start to sweat and this shirt dries faster than I can notice that I'm sweating up a storm. I love it and like its all wool brothers this shirt wicks the sweat away like it's the W2's job! Naturally like I've stated in past reviews for Ibex shirts; it doesn't smell bad after one or two wears because of its wool properties. 3) This shirt fits great! I really love the fit of this garment and every time I throw it on it has that "favorite old T" feel to the shirt. The W2 Sport looks good with anything... jeans, shorts, hiking pants, running shorts... yeah... pretty much anything. I love my t-shirts and one of the best parts about what I do is getting to wear T's just about everyday to work. This shirt gets worn a lot and worn multiple days in a row. That's one of the best parts about Ibex garments... cuts down on laundry! So, if you're in need of that great feeling, great fitting awesome shirt for this summer (and who isn't?) than you need to give this one a hard look. Shoot me questions or thoughts... love to hear 'em!